Works on FLOE Roll-in Docks. Rivets to dock frame. Protects the dock from all sides. FLOE’s heavy duty aluminum cleats are perfect for tying off your boat. 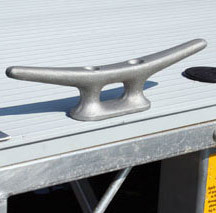 Mounts to the frame of the dock or side mounts using a bracket. Side mount cleats work on roll-in and floating docks only. The ultimate way to keep scratches off your prized possessions. Available in 30″ and 40″ heights. Recommended every 4′ to 6′ where boats will be parked and for use on corners as shown above. Attaches anywhere and has infinite vertical adjustment. Vertical bumpers are available in aluminum or with FLOE’s exclusive Aluma-Grain finish. Bumper edging works great along the dock edge and as a bow protector when entering a slip. 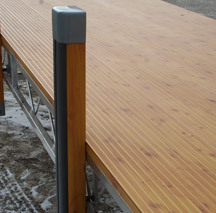 Bumpers are sold in sets of two 10’ lengths and work for roll-in, stationary and floating docks. Side Mount Dock Cleat also shown above.